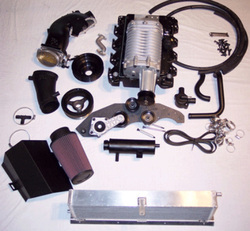 Mustang MP112 Intercooled Kit...$5199.99 + shp. Capabilities: Will easily make 400 RWHP on a bone stock engine and can go upwards to 600 RWHP on a built engine. Supercharger Options: Comes with a high flow Magnuson MP112 supercharger. Can be upgraded to either our TVS 1900 or 2300 units for significantly higher power levels. Note: This is a "Tuner" kit sold without Injectors, MAFS/Filter, Fuel Pump, & Tune. These items are available for purchase separately or on your own to match what ever power level you have planned.